A timing belt runs the engine camshaft. It’s called timing belt because its main job is to precisely time valve opening and closing with up-and-down movement of the pistons. Timing belt replacement is one of the high-price maintenance items that many motorists have to deal with. How often does the timing belt need to be replaced? Timing belt recommended replacement intervals vary from 60,000 to 106,000 miles. There are many cases when a timing belt breaks at a lower mileage than the recommended interval. Usually, premature timing belt failure is caused by faulty belt hardware, leaking water pumps, improper tension and when a timing belt is soaked in engine oil. What happens if a timing belt breaks? There are two types of engines: an interference and non-interference. In an interference engine, if a timing belt breaks while driving, there is a good chance that the engine might be severely damaged. A non-interference engine will stall if a timing belt breaks, but further damage might be limited. The difference is that in an interference engine, valves that are fully open will be hit by the piston as it travels to its top position. In a non-interference engine, there is still some clearance between fully open valves and a piston in the top position. The engine timing might become too retarded (delayed). Symptoms of a retarded engine timing include lack of power and slow pick-up. In some cars, a stretched timing belt can also produce a dull rattling noise coming from the timing belt area. Usually, the noise is noticeable at idle but disappears when the engine is revved. Do all cars have a timing belt? The answer is no, many modern cars have a timing chain instead. A timing chain is a maintenance-free unit and rarely need replacement. 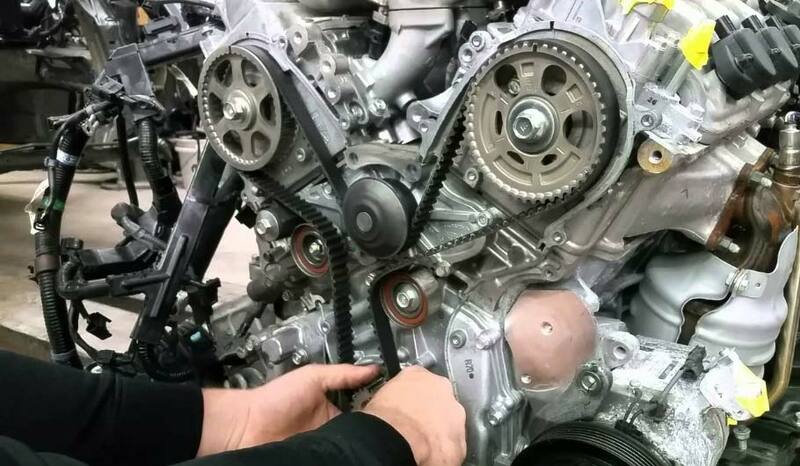 Read more: When a timing chain needs to be replaced. Most Audis have a recommended timing belt replacement at 110,000 miles. But to be on the safe side, many mechanics recommend replacing it earlier, such as around 90,000 miles. In general, Chrysler vehicles should have their timing belt replaced at 50,000 miles or after five years, whichever comes first. Ford recommends that you replace the timing belt at 60,000 miles for almost all of its models. The one exception is the Ford Probe. If you have a Probe from 1999–2004, have the timing belt inspected every 120,000. Hondas can go as much as 105,000 miles before they need the timing belt replaced. However, some models have a shorter recommended interval. Also, read about 4 essential things about winter tires. Trust us your car’s maintenance, contact us now.